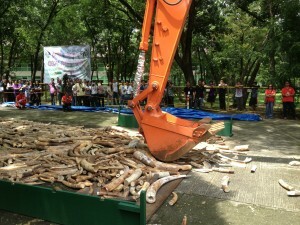 Friday, June 21, the Philippines became the first country outside of Africa to destroy ivory seized by its law enforcement. I wrote about it for National Geographic here: In Global First, Philippines to Destroy its Ivory Stock and here: Pulling Teeth. The United States opposes the international ivory trade but its decades-old stockpiles of seized ivory gather in official places like the US Fish and Wildlife Service’s Colorado repository and unofficially in places like its Philadelphia office. Why? At the destruction ceremony in Quezon City I listened to one of Africa’s leading law enforcement officials, Bonaventure Ebayi, say he hoped this was the beginning, that other countries would now join the Philippines in its stand against the illegal ivory trade. I’ve received countless emails asking what a person who cares about the future of the African elephant can do to help. To many I’ve responded that there’s nothing you can do. You’re an American. Our laws ban international ivory trade and they’re reasonably enforced. But there is something you can do. You can insist the US join the Philippines, which could not by any measure afford to waste >6.5 million bucks. Unless it cared. As Philippine Department of Environment and Natural Resources Secretary Ramon J.P. Paje made clear, the Philippine people he represents did not see the ivory as a financial opportunity. They saw it as the proceeds of a crime to be destroyed. Many without a sense of the poor state of international law enforcement when it comes to trafficked species such as elephants and rhinos complain that any seized ivory or horn should be sold. The animals are dead they say, Why not profit? Why not put the money to law enforcement even? But money from these materials disappears like blood on sand. The illegal ivory trade is at least a $50 million a year business and since the ivory ban was put into place in 1990 not one kingpin has ever been identified. China recently prosecuted a significant trafficker, but it is clear that the biggest players operate freely. In that environment, expanding the ivory trade feeds crime. Whatever the wild species–turtles, pangolins, elephants, rhinos, tigers–there just aren’t enough rare animals on earth to satisfy China. It’s growing too quickly. Legal ivory fed to China expanded that country’s appetite. After the 2008 CITES-approved “one time” auction of 102 tons of ivory to Japan and China, the Chinese government built the world’s largest ivory carving factory. It began training college students to take up the trade. The goal was to process the ivory and to be ready for more, to be ready for an ivory consuming future. China wants more ivory and every bit fed to its system causes that industry to grow, fueling poaching, killing elephants, murdering rangers. China’s economic growth outpaces the natural death of elephants and in the breach is murder, corruption, and one day, extinction. In an ideal world that wouldn’t be the case. But this isn’t an ideal world. It’s the one we have. Categories: CITES, Ivory | Tags: Africa, CITES, crush, elephant, ivory, LATF, Philippines, United States | Bookmark the permalink. After two weeks of my being savaged by the Archdiocese of Cebu for Blood Ivory: Ivory Worship, culminating (so far) in a suggestion by the country’s Cardinal Ricardo Vidal that I be deemed “persona non grata” and permanently expelled from the Philippines (a designation normally reserved to diplomats and the like) it is extremely gratifying to see comments like these rolling in from Filipino citizens on sites such as Rappler.com. I’ve published a response to the Archdiocese and to Archbishop Jose S. Palma here, which applies as well to his predecessor, Cardinal Vidal. Categories: Blog Post, Ivory | Tags: Cardinal, ivory, National Geographic, Palma, persona non grata, Philippines, Ricardo Vidal, Vatican | Bookmark the permalink. 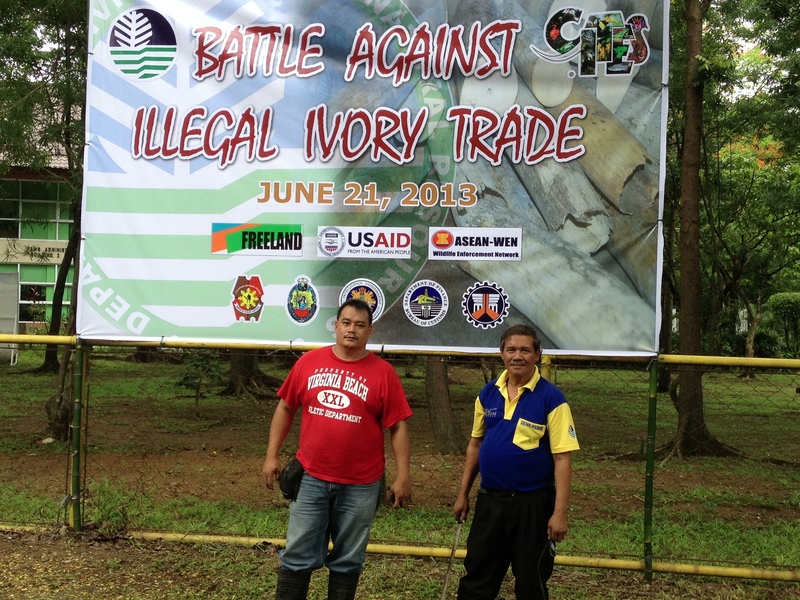 Categories: Blog Post, Ivory | Tags: elephant, illegal, ivory, Philippines, smuggling | Bookmark the permalink. 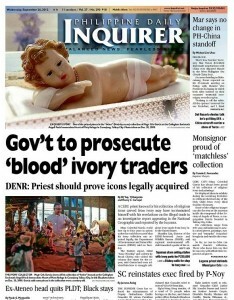 Multiple stories running today out of the Philippines on the country’s ivory trade, the role of certain priests in the trade, ivory dealers in Manila’s religious district, Tayuman, and commitments to prosecute “Blood Ivory” traders. Amazingly, one priest is saying that Msgr. Garcia’s ivory collection is all centuries old (it’s not). Encouragingly, another is saying that ivory is no long an appropriate medium for Catholics to express their devotion. For the record, we do not report that Cebu is the center of the country’s ivory trade, but rather that it is the origin of Catholicism in the Philippines, including devotion to carved images. There are certainly prominent ivory collectors there, too. 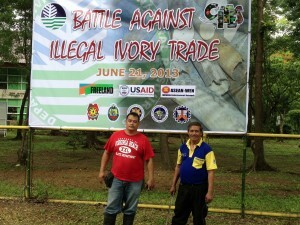 The center of the PH ivory trade is Manila. Margie Matheu of the Archdiocese of Cebu’s secretariat, said the timing of the magazine article was suspicious. “Every writer has his own style of writing and gathering information. It’s difficult to discern his intentions. This can only be part of the devil’s machinations in his desire to divert and threaten the spiritual prepration for the canonization of Blessed Pedro Calungsod. He’s making his presence felt,” Matheu said. Categories: Blog Post, Ivory | Tags: cebu, Cristobal Garcia, elephant, ivory, Philippines, soquino | Bookmark the permalink.